errrmmmm ... wouldn't that be them there sunglasses things then ? Good piece but you state the total number of bikes and scooters and that only 15% wear plugs, but how many ride over 37MPH and for prolonged periods of time. I think if you factor those in the % of people who wear plugs when its needed rises quite sharply. its suprising in this day an age when everything is so monitored in hospitals, i.e design changes are made because of injurys A&E depatments see,that there are no stats to back it up. Though do you need them after a 50mile run and ringing in your ears. For me the helmet makers could and should do more. Proper dependable references on anything motorcycle related are thin in the ground, and a few of my references are quite (read very) old I think your right and that more people may wear ear plugs nowadays. Jack - when I tried to find research on visibility of motorcyclists and accident rates I could find only one research paper published in Australia in 1996. It's conclusions were perhaps predictable, but frightening none-the-less for those of us who choose to wear cool matt black. The research could do with updating and validating. There is nothing, it is amazing as i like to think we are an interesting demographic . I always use ear plugs, but it amazes me how many people don't know how to fit them properly. I have seen so many just stuffing them into the end of the earlobe - this dos not work. 1. Roll the earplug into a tight cylinder. In order for earplugs to fit into your ear canal, you must roll the foam so that it forms a tight cylinder. This makes it easy to slide earplugs into your ear so that you get a proper fit. 2. 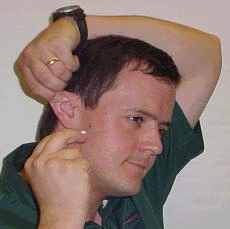 Lift the top of your ear to open the canal. It?s impossible to insert earplugs correctly without pulling on the top of your ear. Otherwise, the canal is too closed off to reach. You will need to grab the top part of your ear and lift slowly. If opened properly, you will feel air coming into the canal. 3. Insert the earplug into the open canal. If you opened the ear canal properly, you should be able to slide the earplug in easily. If the canal isn?t open enough, you will find yourself trying to squish the earplug into place. 4. Hold earplug in place until the form expands. The foam will take a bit of time to expand. If you simply insert the earplug and then pull your hand away, the earplug will pop out. Instead, you need to gently hold the plug in place until the foam fully expands. This ensures that the earplug blocks out as much noise as possible. 5. Repeat Steps 1 ? 4. It?s important to insert one earplug at a time. Otherwise, the foam will expand before you can begin work on the second ear. It may take a few tries before you?re able to insert earplugs properly. If you have trouble getting the canal open, make sure to re-roll the earplug so that the foam is tight. If earplugs don?t seem to be doing their job, even after several attempts, try buying a new brand. Forcing earplugs into place can cause your ears to ache. Wash your hands before you insert earplugs. Once rolled, insert earplugs immediately or the foam will expand too much. "In our opinion, motorcycle helmets will not always reduce noise levels significantly, and, in fact, they may actually cause higher levels of noise in more harmful frequencies than might be expected. Riding without a helmet is definitely not an answer, both for reasons of safety and because of the extreme volume of noise when riding without a helmet. Some claim that riding without a helmet allows the rider to hear other vehicles more clearly, but this is usually not the case when riding at higher speeds without a helmet. There are many variables that can cause helmet noise, including helmet design, motorcycle design, weather (i.e., cross winds), turbulence and also the configuration of the motorcycle's fairing or windscreen. Some helmets are intrinsically quieter than others, either due to their design, the liner, the aerodynamics or how the helmet fits the rider's head. We strongly suggest wearing high quality, correctly fitted earplugs whenever you ride a motorcycle. This can help minimize the risk of hearing loss, reduce stress and make the riding experience more pleasant." Interesting thread , I have had a hearing loss for over 15 years now . Nothing serious but i really struggle with a conversation in a group or when there is background noise . Having done lots of miles on bikes in my younger days i do believe it has a lot to do with that as i never wore earplugs in the eighties and nineties . machine shops and noisy work condidtions iam sure haven't helped iether . When i first began wearing earplugs i felt like Wal does and would have egreed with him about the percieved loss of senses from no hearing . Now having used them for some time i feel its totally the opposite .Your ears are rendered ineffective from huge noise of riding screen or not . If you get the right plugs for the riding you are doing the big confused wind noise is cancelled out and you are able to pick out noises such as a police siren much easier . At anything over 30 what else are you trying to hear while riding anyway ? you use sight not hearing . Modern cars also cocoon you in a quiet world cut off from the outside . deaf people are in not classed as having any driving disability if hearing was important while driving they would be made to have some sort of badge on the car. Modern cars also cocoon you in a quiet world cut off from the outside . The fact is ear plugs do not stop all noise, they reduce it to a harmless level. +1 Everything you say there describes me. Ear plugs to me are similar to when the seatbelt law came in,it was strange at first but after a while it,s strange without it.When I first used ear plugs it was a bit of a nuisance but now it,s just like a ritual as putting on helmet,gloves etc. suppose if you greew up in a shoes box in the middle of the road witjh cars screeching over your head evrything else seems quiet. at the end of the day i think it is simplistic, putting something quite tightly fitting into your ear, which is designed to stop noise, cant really make you hear better, can it just saying..